Our online tools will provide quick answers to your calculation and conversion needs. On this page, you can solve math problems involving right triangles. You can calculate angle, side (adjacent, opposite, hypotenuse) and area of any right-angled triangle and use it in real world to find height and distances. Download: Use this right-triangle solver offline with our all-in-one calculator app for Android and iOS. 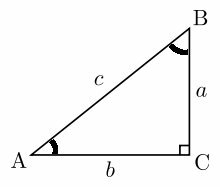 Area = a*b/2, where a is height and b is base of the right triangle.